It’s not perfect, and there will always be things that I’ll grouse about. But there are other things about OS X that I love. Chief among them: Internet sharing. The feature has been around for years, and over time it has become one of the most useful tools that any Apple tech person could hope for. That’s because it provides one thing that’s necessary on all too many onsite tech-support calls: A quick, reliable way to get Internet access on a Mac that lacks it. It has saved my skin more times than I care to count, and it’s been reliable since I first started using it several OS X revisions ago. It’s also dead simple to use. You first connect a FireWire or ethernet cable between your own MacBook (you’ll need Apple’s USB-to-ethernet adapter if you’re using a MacBook Air). Then you launch OS X’s System Preferences, open the Sharing Pane, click Internet Sharing, configure the port on your MacBook through which you’d like to share your Internet connection, check the Internet Sharing box, click Start, give OS X a few seconds to process the change, then close the System Preferences window. 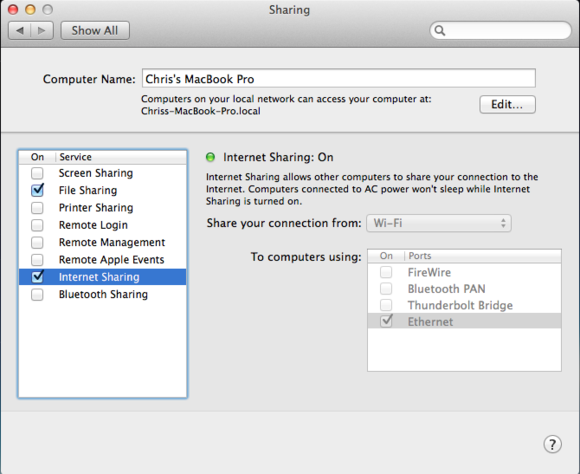 The Sharing pane in System Preferences. That done, you open a Web browser on the computer you’re trying to fix, make sure it can connect to the Net, and you’re off to the races. You can now download whatever system software, firmware updates, or drivers you might be missing to get the native Internet functionality working again on the client’s machines. You can then go online from the client’s machine to grab whatever software or other updates are required to fix its other problems. If you’re dealing with an older Mac or PC that has an 802.11b or 802.11g Wi-Fi card, you can download larger files via your own Mac’s faster ethernet or Wi-Fi connection, then transfer to the older machine via FireWire or ethernet. If you’re dealing with a Windows PC, Internet sharing from your Mac can make all the difference, especially if the client managed to lose the driver CD that came with his or her PC. It’s easy enough to connect an ethernet cable between your Mac and the Windows PC, activate Internet Sharing on the Mac, make sure the PC has an active Internet connection via your Mac, then open Windows Update on the latter and begin the long, tedious process of making sure that Windows has all the drivers and updates it needs. While it’s not the fanciest fix in the world, Internet sharing is helpful and the perfect reason to keep a FireWire cable and an ethernet cable packed in your tech bag at all times. Your client’s Mac or Windows PC and its Internet connection may be borked when you get there. But you’d be amazed at what a simple online connection can do to fix the problem.